Celebrations as we announce our expansion !! The High Sheriff of Norfolk paid a visit to Open Road on the day we announced an exciting expansion into a new area. 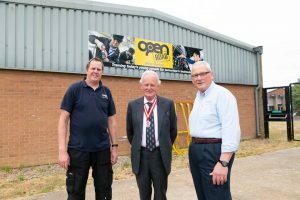 Charles Watt visited Open Road West Norfolk on Friday (July 6) to take a look at its facilities on the Hardwick Industrial Estate, and learn more about its work. The charity offers automotive training to young people experiencing difficulties in mainstream education – and it’s going to branching into construction from September. The High Sheriff was also joined by Open Road West Norfolk supporters as well as the charity’s staff, students and former success stories. Charles Watt Esq said: “I’ve actually heard that Norfolk has among the highest rates of school exclusions in the UK. 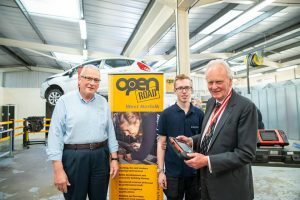 It’s a complicated issue, but services like Open Road West Norfolk give young people struggling at school the chance to get away from that environment, to learn about vehicles and mechanics. “After a while, as they start learning, they begin to feel more confident, better about themselves and want to make a go at real life. You can see the impact it has on these young people’s lives from the success stories we’ve met and heard about today. The news of Open Road’s expansion has been warmly received by organisations including The Engage Trust, which is already in talks about making the most of the new services as excluded students in West Norfolk currently travel to Norwich to use its facilities. Young people in West Norfolk, many of whom may struggle at school, are able to visit Open Road’s modern and well-equipped facilities to learn the ins and outs of vehicle mechanics – and have the opportunity to gain industry-recognised qualifications from the experience. Schemes are also available for 16-24 year olds who want to achieve a motor vehicle qualification, gain work experience in the workshop or receive career guidance on their path to employment.